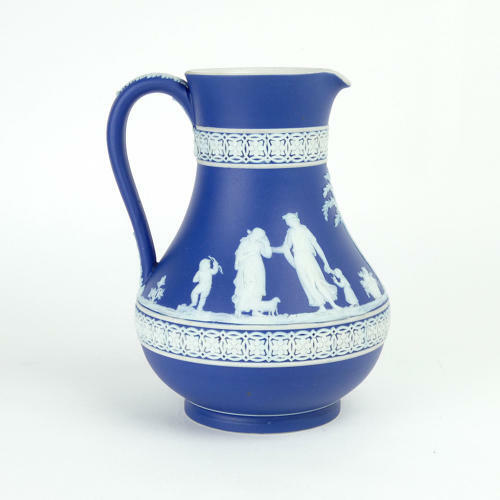 A Wedgwood, dark blue jasper dip 'Etruscan' shaped jug. This piece has impressed marks to the base which include 'WEDGWOOD ENGLAND', the number '24' and a small letter 'F'. The jug dates from c.1900 and the number would be a batch number. This shape was catalogued, by Wedgwood, as the Etruscan shape. It is decorated with a band of classical figures and trees around the centre and this has bands of stylised flowers within a geometrical framework both above and below. The reliefs are very good quality and the jasper dip is a rich shade of blue. The piece is in excellent condition.